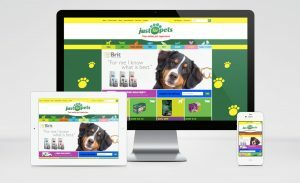 Just for Pets are proud to announce their redesigned website. The new responsive site, designed by Sharpmonkeys provides customers with an enjoyable and convenient online experience and exclusive online deals on quality pet products. Just for Pets are dedicated to promoting responsible pet ownership. In addition to convenient online shopping, the new website includes a detailed pet care section offering advice on how to look after a wide variety of animals, from the family dog to more exotic animals such as tarantulas and lizards. There is also a dedicated Just for Pets blog, highly recommended for animal lovers and customers wanting to stay informed with regular updates, competitions, animal charity news and tips for pet owners of all ages. Visitors to the website will also find a useful store locator that gives the details of the 21 stores currently found throughout the UK. Justforpets.uk.com complements the excellent services customers enjoy in their local Just for Pets store. Just for Pets look forward to continue working on their digital growth and engaging with their online audiences.